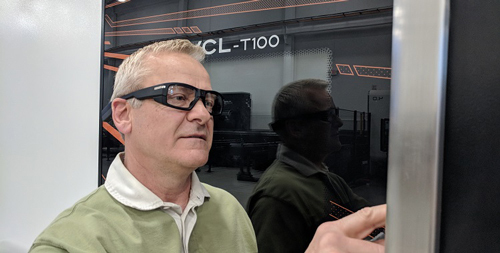 Mazak Optonics now offers Mazak Smart Glasses to better serve laser-cutting customers by letting a Mazak service technician remotely view what laser operators see. Using these glasses provides improved troubleshooting and responsiveness, leading to more rapid resolutions and reduced machine downtime. Also, remote viewing saves on costs related to customer-service in-person calls. The wearable Smart Glasses utilize telepresence, a two-way audio communication that incorporates one-way video through live-feed streaming or recording. How do they work? With integrated camera and audio, users call Mazak customer service directly with the touch of a button. Once connected with the Mazak support team through WiFi or a data hotspot, customers can stream what they see at their machines. The auto-focusing camera allows Mazak support members to visualize the issue, and walk laser-cutter operators through their current situation and begin the resolution process. In addition, the glasses can record standard operating procedures, which are then archived for viewing by operators. The Smart Glasses are not machine-specific, so any Mazak laser customers, even those without the latest in laser-cutting technology, can still use the glasses for their existing laser-cutting machines.